← “DEAD LINE” NAMED SCARY STORY OF THE WEEK ON PARANORMAL, EH? 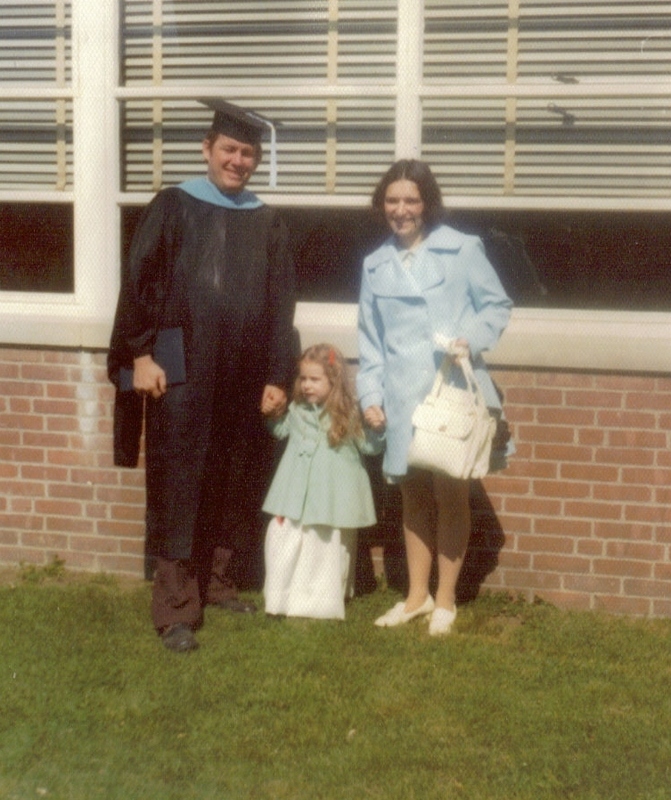 Dad, Mom and me at Dad's Master's Degree Graduation, May, 1974. Today is my late father’s birthday. I’m not going to get all mushy on it, because those of you who know me well know that, although he and I had a lot in common and enjoyed talking, it wasn’t always a quiet walk through the woods. One of the things we discussed often over the years was a paper he’d written on Robert Frost which presented the idea that Frost, contrary to popular belief, viewed nature as hostile and even threatening. 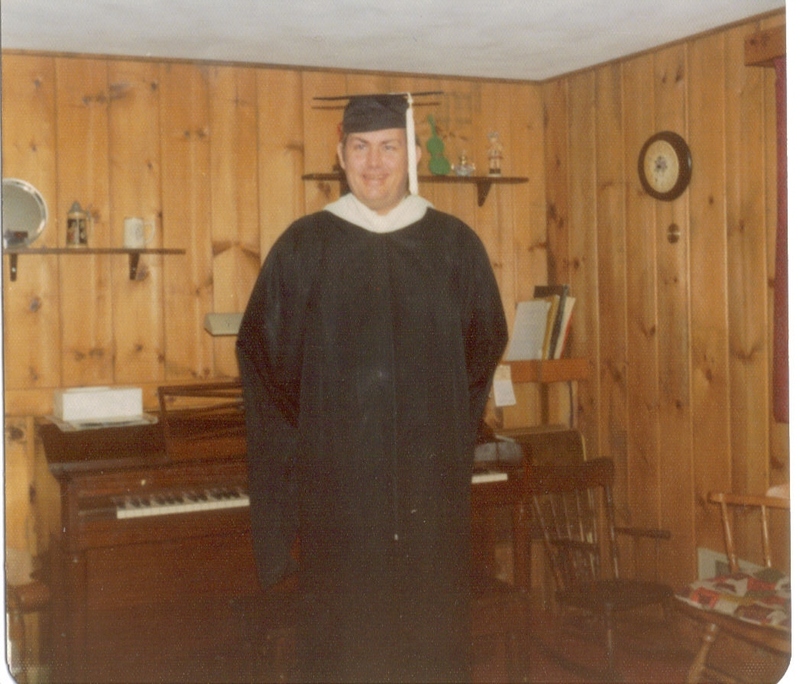 Dad in his cap and gown, May, 1974. What's scary is that piano was in the same place in the house when we cleaned out the place in 2008. 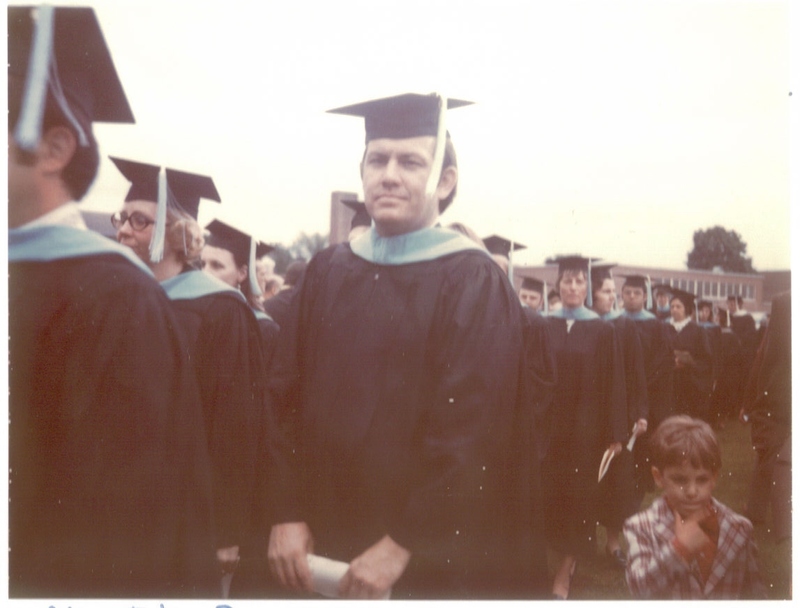 Dad in the procession at his graduation, May, 1974. In January 2008, he passed away. 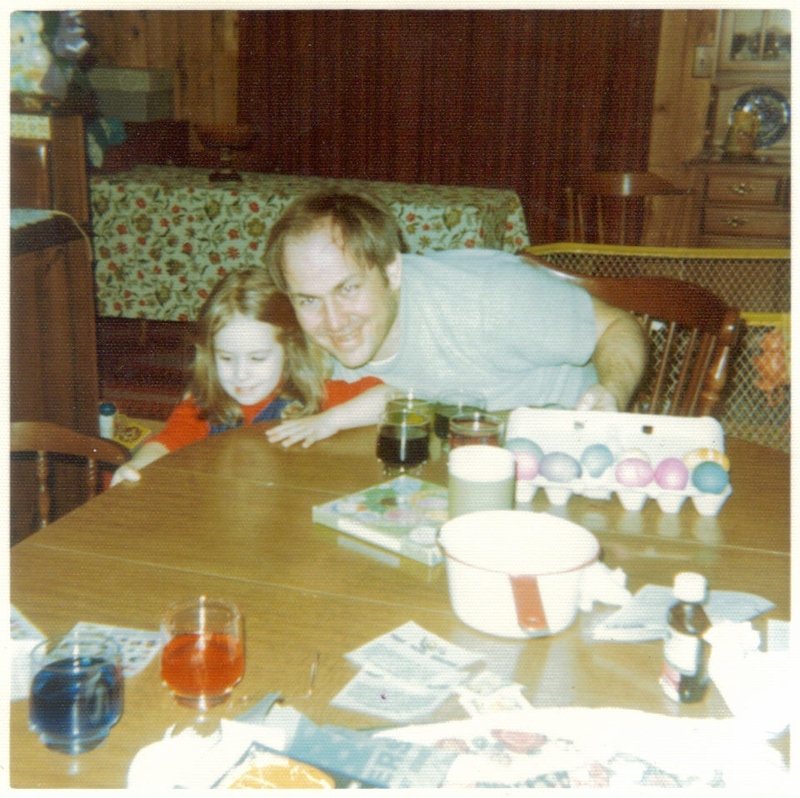 Making Easter Eggs, Spring, 1974. After the weather had cleared a little bit, the fact that I had never gotten to read this paper ate at me. It had to be someplace in Dad’s house, which we needed to start cleaning out anyway. So I started a search. Months went by—I went through every plastic tub, every rusted file cabinet. I flipped through the pages of every single book in his den in case it had been shoved inside one of them. I even fingered through the accordion files where he kept his taxes (dear God, he still had the paperwork going all the way back to 1982). There was a lot of junk in that house (it really did feel like “miles to go before I sleep”), but each new unturned stone brought possibility. I knew damn well what they were. They were his note cards for writing the paper. Me and Dad, Summer, 1974. 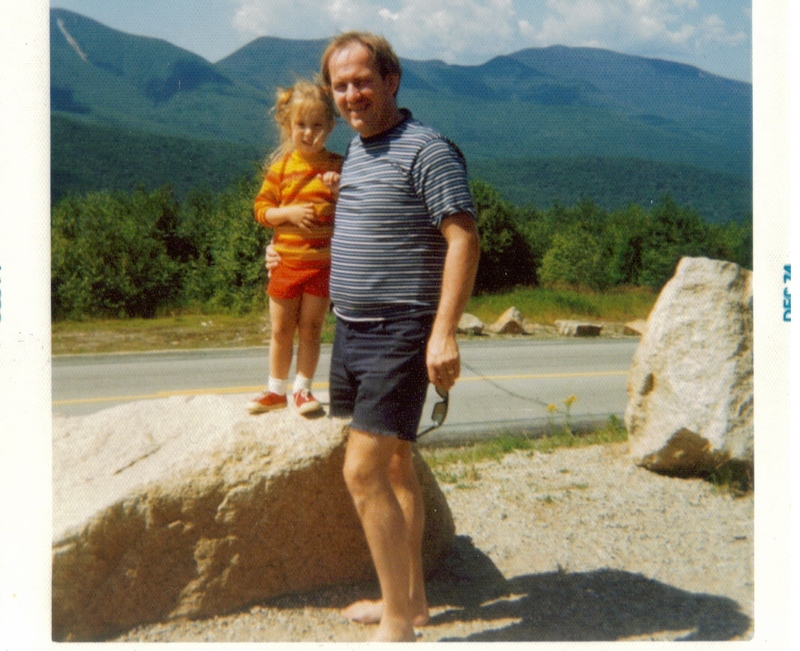 I had thought initially that this photo was taken in either New Hampshire, near Franconia Notch, or on Route 89 up near Burlington, Vermont--but if you look at the mountain to the extreme left, the location is given away: that's Mt. Whiteface, near Lake Placid, New York. That "scar" that runs down the mountain has been mistaken for a ski run, but it's actually from an avalanche. This means this photo was probably taken in Keene or possibly Upper Jay, New York, along Route 9. If anyone knows for sure, please give me a shout out. PS -- LOVE that my Dad's not wearing shoes. He never wore shoes. He'd even drive barefoot. My mother couldn't stand that. This galvanized me—this meant it did exist. Still, months went by and it didn’t turn up. With the house completely cleaned out and ready to renovate and still no sign of it, I realized there was one more place I could try: he had graduated with a Master’s degree from Southern Connecticut State University. If this was his final paper, there was a chance it was in the SCSU archives someplace. I contacted the university system and they did locate a thesis by Charles W. Petersen. Thrilled, I arranged to pay for and have a copy sent to me. When it arrived, it wasn’t on Robert Frost. It was about some obscure facet of Hitler’s rise to power in Nazi Germany. I read the whole paper—and it was pretty interesting, actually—but it didn’t feel like Dad’s writing style, and when I read the acknowledgments at the end of it and Mr. Petersen was thanking his wife (Sally or Sandy, I think her name was) and mentioning his children (who weren’t us), I realized it was a different Charles W. Petersen. That last round with the SCSU Library was it. I was at the end of the trail; there were no more places to look. I decided to just let it go, figuring that, like a ClioPlayers scrapbook and some miniature dolls I had when I was eight, it had gone to that great cave in the sky where all lost items go. I went on with my life. Got my MFA from Goddard College, finished renovating and sold Dad’s house, went to the Norman Mailer Writer’s Colony, wrote a bunch of short stories and got them published. Then, in the spring of 2010, I was working on a piece for my blog and wanted to reference an old, unpublished short story of mine that had one of Frost’s poems as a major theme. I opened a suitcase where I kept the hard-bound, handwritten journals and files of my short stories that I’d written when I was a student at the University of Rhode Island in the early 1990s. Sitting there on top of the stack was a document typed on onion skin that I didn’t recognize. I took a closer look. ROBERT FROST—AN ALTERNATE VIEW. Charles W. Petersen. The name of the class, his professor, the date (1974). For a second I sat there in shock. This was it. This had to be it, the it, the paper he’d been telling me about my whole life. I flipped through it. Sure enough, it was the thesis he’d described. Then: where the hell did it come from? I could say that I’d found the paper years ago and stuck it in the suitcase, but A, obviously I’d never even seen this paper—so momentous a thing I’d have remembered—and B, I opened this suitcase every couple of months because I’d be in search of some story or journal entry I wanted to steal a line from or just re-read. So this wasn’t a case in which the suitcase had sat forgotten for two decades. In fact, I was pretty sure that I had checked through every suitcase, including this one, in my search for the paper nearly two years prior, on the off-chance that it had been given to me at one point and I just didn’t recall it. And this wasn’t even buried or stuck between other papers, so I clearly wouldn’t have missed it. This was sitting there right on top, face up. I have to tell you it was a little bit creepy (Stephen King’s short story “Sometimes They Come Back” came to mind), but it was also a little bit magical. It says something about the nature of searching. If we look too hard for something, it eludes us. If we stop searching, stop hanging on, chances are, it’ll come back to us when we least expect it—and probably when we need it most. As a way to ensure I’d never lose this paper again, I made several copies of it, then re-typed it so there would be an electronic copy. It appears below as a PDF. 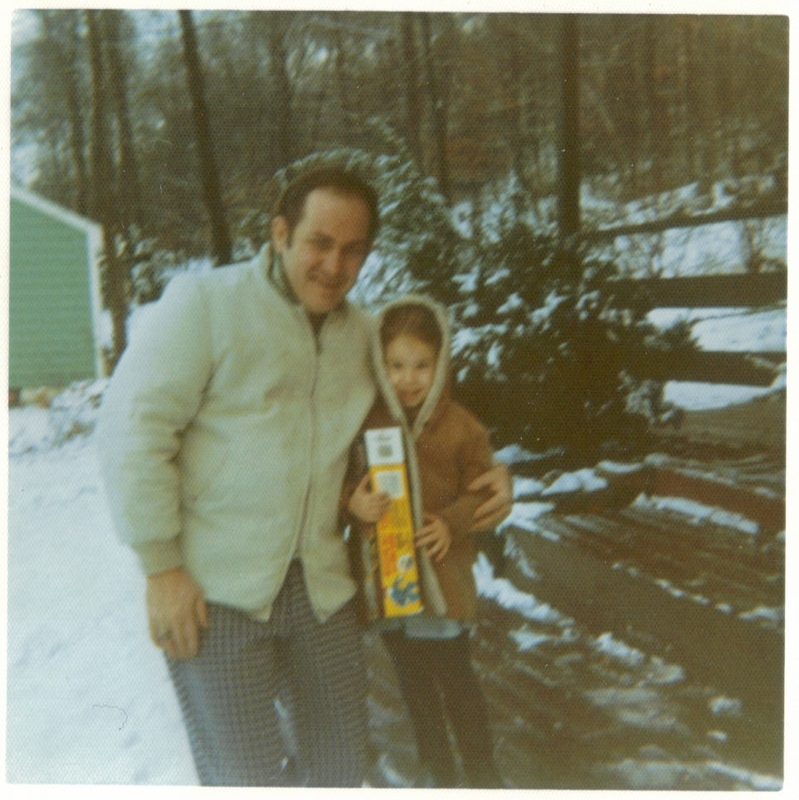 Me and Dad on the front steps, Winter, 1975. And miles to go before we sleep. PS -- Nice pants, Dad. Posted on February 17, 2011, in Deep Thoughts & Fun Stuff and tagged Charles W Petersen, dark poetry, Robert Frost. Bookmark the permalink. 4 Comments. Hello. I really enjoyed this post and would love to include a link to it in my new ezine: HALF LIGHT, which debuts online this Tuesday. Would it be alright to include your Gravatar image with the link? Ms. Schoonover, very compelling story. Photos added a nice touch. Good job! Thank you for the kind words, Chris! They mean a great deal.